Over the last couple of months, MobileMe has gotten faster and shinier, gained that promised file-sharing feature, and, arguably, evolved into an integral service. Apple announced many of these updates and fixes on its MobileMe News blog, and now it's highlighting one of MobileMe's clever, albeit unsung, features: Google Maps integration. MobileMe's Web-based Contacts app (subscription required) includes a fairly stealthy integration of Google Maps. If you have a physical address filled in for a contact, clicking that address will display a small popup containing an interactive map. You can swap between map, satellite, and hybrid views, though zooming is disabled (even via two-finger scrolling on MacBook trackpads). A link to open the map in Google Maps does just what it says, though, so full Google Maps functionality isn't far away. 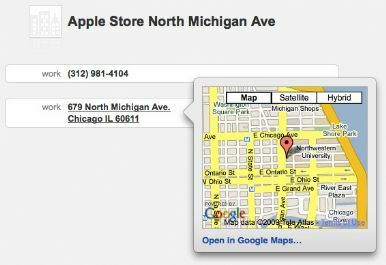 This kind of integration is great and Apple doesn't hesitate to liken it to the experience on the iPhone and iPod touch, where tapping a contact's address will open the Maps app. We hope it's also a sign of more MobileMe features to come, as Mac OS X contains no shortage of tight integration. Now that MobileMe's Web apps are behaving more reliably, the service could benefit from more fit-and-polish like this. For example, dragging a photo from the MobileMe Gallery onto the service's Mail icon could be a quick option for e-mailing a copy (or at least a link); ditto for iDisk files. Adding this Google Maps pop-up to geo-tagged Gallery photos would be nice, and the ability to create calendar appointments from Mail messages and contacts could be big productivity boosters. With any luck, maybe some major new features like these will get their own time in the WWDC '09 keynote spotlight.